Info "Use the dumbbells to get pumped! Maybe you’ll get as buff as me!" Up In Arms is one of Dribble and Spitz's Microgames in WarioWare: Smooth Moves. Its name is a pun on the term "up in arms", that means a strong opposition against something. 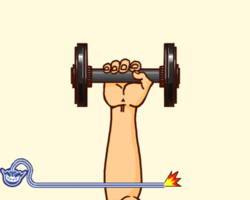 The player has to simulate lifting weights by moving the Wii Remote towards him/herself and then down. Rarely, the hand holds an orange. This page was last edited on February 20, 2018, at 15:13.